My television viewing has dropped dramatically over the last few years. Perhaps it is the sign of the changing of the times and the changing of technologies, but my family recently dropped our cable subscription because we would not turn on the television for weeks at a time. As for me, I hardly even watch programs on the computer – opting for books instead. However, even when I watched television, I did not bother myself with the typical programs. Indeed, I skipped straight from Scooby Doo to CNN – for a couple of years, switching back and forth between the two channels. For many years, I watched a great deal of Bloomberg, BBC, and History International, among others. It was on one of these channels that I first saw Ayaan Hirsi Ali in a debate presented by Intelligence Squared Debates about the assertion of Islam being a religion of peace. It didn’t really matter whether or not I agreed with her, I just found myself so memorized by her demeanor, her confidence, and poise. I was very impressed. This positive impression led me to pick up her memoir, Infidel, when finding a book about the country of Somalia. I eventually decided to pick two books: her book and another book dealing with Somali piracy. This was an excellent decision because my book choices not only left me with an understanding of hot topics of the region, but also a deep understanding of the Somali culture – from parent/child relationships to political strife, from the role of religion in society to men and women’s relationships – from a personal account. Ayaan Hirsi Ali is a very interesting woman with an unbelievable story. She was born in Somalia to a man who was an active opponent of the dictator Siad Barré (who took control of the government in a 1969 military coup, nine years after the country’s independence from Britain and Italy in 1960) and his second wife. 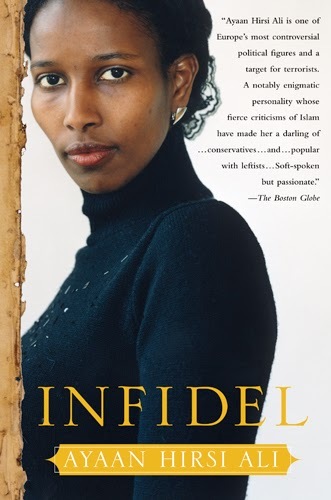 Her father thrown into prison in 1972, Ayaan Hirsi Ali grew up without the influence of her western educated father, which led to her maternal grandmother conducting the Somali tradition of female circumcision on her and her younger sister. Her father eventually escaped from prison to form the Somali Salvation Democratic Front (or the SSDF) against the socialist regime of Barré. To ensure the family’s safety, they were uprooted and lived as sort of glorified refugees in Saudi Arabia, Ethiopia, and Kenya. Despite growing up in different places, the most important and the strongest aspect of Ali’s life was her home life, which was strongly based in Somali tradition. In the midst of these moves, her father became estranged from her family and eventually found another wife. Returning to Mogadishu (the capital of Somalia) in her 20s, the Muslim Brotherhood had gained a foothold in the minds of the people. While Siad Barré had been socialist, secular, and anti-clan, “the Brotherhood was above politics – and clan; it was fighting for God’s justice.” (page 126) In the midst of this extremism, Ali found herself confused and challenging her strongly Islamic upbringing, “But I found that everything Boqol Sawm [a Somali religious leader] had said was in [the Quran.] Women should obey their husbands. Women were worth half a man. Infidels should be killed.” (page 104) Based on these doubts, and at a time when her father forced her marry a man against her will, she ran away and sought political asylum in the Netherlands. It was in the Netherlands where Ayaan Hirsi Ali finally came to her own. Learning the Dutch language, she worked as a translator and eventually became enrolled in Leiden University – finding herself more and more impressed with Western culture: “We had always been sure that we, as Muslims and Somalis, were superior to unbelievers, and here we were, not superior. In day-to-day life, we didn’t know how the cash machines worked or that you had to push a button to order the bus to stop.” (page 223) She eventually gave up her faith and became an atheist activist, as well as an activist for women refugees and women in the Muslim world. Her increased prominence in society led her to become a member of the Dutch Parliament, as well as to be the recipient of a great deal of death threats. Indeed, after collaborating in a film in an attempt to expose some of the difficulties women face in Islam, the filmmaker Theo Van Gogh was murdered and a death threat on Ali’s life was stabbed into his body.